Doom music and a name like Wall Of Sleep… you are thinking Ozzy era Sabbath, those sludgey, crawling guitar sounds that Iommi wrenched from his wailing guitar on the first six albums right? Well actually you’re wrong. Not in that WOS don’t appear to take their influences from the mighty godfathers of metal but because they sound closer to the driving sounds of the Dio and Seventh Star eras than they do to, er Wall Of Sleep. 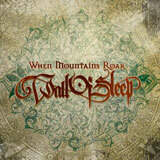 Strange, but then again I have to admit I am massively late to the party on this one, having never heard of them before as the band Wall Of Sleep have been around since 2002 and ‘When Mountains’ Roar’ is their fourth album in that time. Hailing from Hungary they marry traditional doom sounds with a more classic rock blues sound and scored rave critical reviews with the ‘Overlook The All’ EP in 2003, the (apparently) awesome ‘Slow, But Not Dead’ in 2004 and their best album ‘Sun Faced Apostles’ in 2005 before the wheels seemed to come off with 2007’s ‘…And Hell Followed With Him’ where reviews would suggest the band found themselves creatively out of gas. Now back with new vocalist Csaba Cselényi they are attempting to bring in more variety in the vocal department and complement the Sabbath inspired midterm songs. With the album clocking in at 40 minutes this is quite a manageable listen for a doom album and just as it says on the tin, this is Traditional doom metal with very strong Black Sabbath hints. There is a heady mix of bluesy atmosphere and solid thick sounding traditional doom metal, so any fan of the early material should check out this new record as it is regarded as something of a return to form. Personally I struggled to like this album despite all the signals from the press release; for me it didn’t have the charm of some of the other releases I have listened to from Psychedoomelic or the genre. There are some incredible riffs on display here which shows that WOS have the chops to deliver everything they promise, for example the intro to ‘Hungry Spirit’ is a great strong album opener and lives up to the comparisons to Dio era Sabbath. Until the vocals kick in…. It seems a little harsh to single out a band member, but it is here the comparisons end as unfortunately, whilst not being terrible, Cselényi doesn’t quite seem to fit in with what the music is doing. Sometimes he is abrasive when he should have been more melodic and at others he just seems out of place with some of the lyrics coming off as cheesy or chest beating, with many moments more in common with Manowar than ‘Masters Of Reality’. I must stress this is just a personal preference, at times the album has infectious grooves and a stomp that recalls classic rock bands like Thin Lizzy added to the myriad of usual suspects that make up stoner and doom influences – The Obsessed, Cathedral, Down, Trouble… take your pick. When they get the delivery right some of the tunes on ‘When The Mountains Roar’ like ‘Raven Avenue’ make all the reservations and criticisms vanish and you can just sit back and marvel at a band producing great passages of music. However it simply doesn’t happen often enough, the musical and vocal inconsistencies prove to be enough of a distraction to take any shine off this release which is a bit of a shame really as it promised to deliver so much.